A damp chill hangs heavy in the city air, muffling my footfalls as I trudge through the graveyard after her. She's maybe twenty yards ahead of me, so absorbed with whatever she's scribbling in her moleskine that she's yet to notice me. My fingers once more find the ornate handle of the dagger in the bag I wear slung over my shoulder, tracing the delicate line of its filigreed design. I quicken my pace, closing the gap between us. I've been following her since she hopped a cab out front of that gluten-free bakery on Arthur Ave., and straight-laced as she looked, I didn't figure her for bee-lining it to Woodlawn for an evening stroll among the headstones, but who am I to judge -- and anyways, it's not like I know the woman. Her head raises as she hears me coming. Flashes a smile -- guarded, polite. My palms are sweating. Nerves kicking in. Just get it over with, I think. "Hi," I say, my tone all friendly-like, disarming. "I hope I didn't startle you." "Not at all," she says, and then she frowns. Her hand drops to her side, and her eyes widen as she realizes what isn't there. "Hey, is that my bag?" I shrug the strap off of my shoulder, hold it out for her to take. "Yeah. You left it at the bakery -- I tried to flag you down, but you were in the cab to quick for me to catch." "And you followed me all this way?" "Uh, yeah." I swallow hard, then dive right in. "Hey, I was wondering, you maybe want to get some coffee?" She smiles. "I'm sorry. I can't." I redden. "Oh. That's cool." I turn to leave, but then something occurs to me. "Hey, what's that funky dagger thing about? The one in your bag, I mean." Her frown returns. "You looked inside my bag?" "Well, yeah," I say. "I figured if I couldn't catch you, I could use the address on your license to return it. Only when I opened it, there was no license, just some goofy-looking knife." "Ah," she says. She removes the dagger from the bag, and turns it over in her hand. "This is actually a replica of the ceremonial daggers used by bocors to perform blood rites." "You some kind of historian?" "No. I'm a writer. And good prose don't come cheap." Her hand flicks out, and the dagger plunges into my gut. I crumple to the ground in front of a headstone that reads Melville, my blood seeping into the soil beneath. "Don't worry," she says, wiping the dagger on her shirt before slicing open her own arm and letting her blood drip onto the headstone, where it runs down and mingles with my own. "That wound probably isn't enough to kill you. But sometimes the writing gods demand a little more than I can give." My vision blurs, my stomach churns. And my last thought before I pass out is, This chick's book better be a doozy. Where was I? Oh, right -- the interview. Big thanks to David, both for his quality questions and for thinking anybody might give a damn what I have to say. If you do happen to give a damn what I have to say, pop over to his blog and check it out. As in promises. Specifically, the one where I said I'd be popping in here weekly to dust for cobwebs. If you scroll down a touch you'll see I missed my mark last week. But I've got a pretty decent excuse. See, lately, my tank's been empty. I found out a few weeks back that my company was restructuring (I know, I know; no day-job stuff on a writing blog, but bear with me), which is a polite euphemism for me and everyone I work alongside losing their jobs. It was an amicable parting, and by the time the higher-ups made the call, there was nothing left that could've been done, but regardless, the process of packing up and shutting down is one that takes a lot out of you, both physically and mentally. So last week -- my last work week -- I'd get home exhausted from packing and hauling and whatnot, and bloggage wasn't exactly high on my priority list. This week, my first week off, it seemed my well was empty, too. There's only so many hours in a day one can job-hunt, and I assumed with all this free time, writing would be a breeze, but when I tried, the words just wouldn't come. So I cleaned. I cooked. I took a couple long walks. (There was a trip to the veterinary ER, too, but that's a story for another time, and since my cat is sleeping happily on my lap as I type this, it seems that story ends okay.) And I'm pretty sure this fallow period is passing. 'Cause right now, my days are kind of empty, too. And no amount of poking 'round the internet seems to fill 'em up. Plus, that old familiar itch is returning. (Hey, no jokes; this is a family blog.) The itch to get some words down. To fill some empty pages. I think it's high time I get back to work. Okay, home sick today, and with little to report. Except this: the May 2010 issue of Alfred Hitchcock's Mystery Magazine, featuring my comic caper Action, is now absolutely, positively in stores. So say my spies (and by "my spies", I mostly mean my dad, who harassed two fellow customers and at least one barista at Borders into reading it, or at least nodding politely and pretending to). So yeah. Check your local Borders, or call up your favorite indie bookstore and ask 'em if they have it. If they don't, call up your second favorite indie, and so on. Or, you know, don't. But I'd really prefer you did. UPDATE: Patrick Shawn Bagley had some nice things to say about Action. You can check 'em out here. 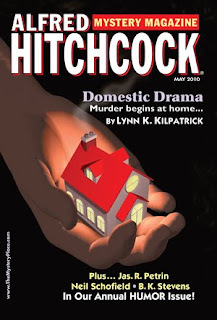 Looks like Alfred Hitchcock's Mystery Magazine has updated their site to reflect the release of their May 2010 issue, featuring Action by yours truly. If I had to guess, it should be appearing at newsstands (and Borders and the like) over the course of the next week or so.